The rapper Kanye West, leaving no stone unturned, has included Amazon.com -- and more than 50 others -- in a new lawsuit intended to shut down some digital currencies that have sprung up bearing some variation of his name. The lawsuit follows the creation of "Coinye," a digital currency that was inspired by West and was invented to provide an alternative to Bitcoin, another digital currency that some would say is more established. Coinye was developed to provide a more consumer-friendly version of Bitcoin, though it never really took off once West got wind of it. A cease-and-desist letter was filed against the creators of Coinye last week, alleging trademark infringement, among other claims. Coinye's developers, however, seemed undeterred upon receiving the letter, advancing their launch date in response. The lawsuit filed Tuesday goes further, alleging trademark infringement, unfair competition, publicity violations, and other claims. 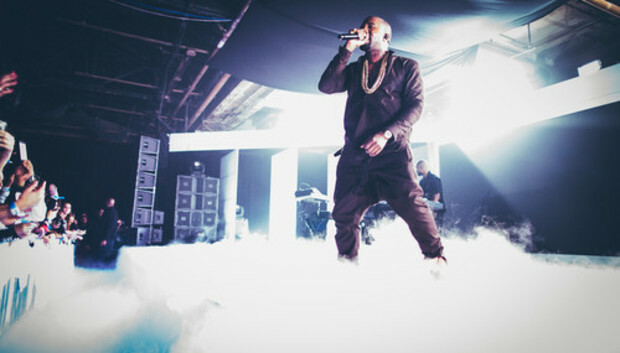 "Defendants have admittedly and willfully infringed upon the Kanye West mark and consumers are likely to mistakenly believe that Mr. West is the source of these digital coins," said the suit, which was filed in the U.S. District Court for the Southern District of New York by attorneys at Pryor Cashman representing West. The suit seeks damages of an unspecified amount. Amazon was identified for providing web hosting services for the Coinyeco.in and Coinyewest.com websites. As of Tuesday evening Eastern time, the latter website appears to have been deactivated, but Coinyeco.in is still up. However, "Coinye is dead," Coinyeco.in's landing page reads. "You win, Kanye," it said. The Coinye developers could not be immediately reached for comment, nor could Amazon. In addition to Amazon, digital currency sites like Coinye-Exchange.com, Daycoins.com and Newchg.com were cited, at least one of which seems to have already been taken down. Even Dogecoin, a different digital currency named after dogs, is included in the suit. Some 50 other unidentified plaintiffs were cited, including, but not limited to, servers, web host companies, cryptocurrency exchanges, or other entities acting on behalf of any others who make use of the "Coinye West," "Coinye" or "Coye" marks, according to the suit. "With each day that passes, Mr. West's reputation is irreparably harmed," by the use of those marks, it said. The suit also included nearly two dozen tweets revolving around the Coinye currency, which the suit said caused consumers to mistakenly believe that West was the one who launched it. Some of the allegedly infringing sites have been deactivated, but West's legal team is still going after the others, said Brad Rose, an attorney at Pryor Cashman, via email. "Those that have profited from this illegal exploitation will continue to be vigorously pursued for damages," he said.